Swedish singer-songwriter dances, squats, and woo’s the crowd at the new Washington’s in Fort Collins. 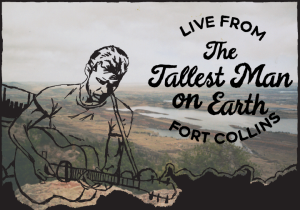 “I don’t think there could be a better place to come back,” announced Kristian Matsson, a man also known by his stage name, The Tallest Man on Earth. A lone, inebriated girl from the back expelled, “welcome back” and what a welcome back it was. After a two year touring hiatus, Kristian Matsson surprised the crowd with a performance of unreleased singles, oldies, and songs from his last full length record, Dark Bird Is Home. Unsure of what the night would behold an intimate set by The Still Tide allowed for a smooth transition into Matsson’s set. Matsson gave a nice shout out in between “Revolution Blues” and the new, unreleased “All I Can Keep Is Now,“ to the The Still Tides lead singer, Anna Morsett. Morsett resides in Colorado and has become a staple in the Colorado music community. “I love you, Anna” remarks Matsson. Anna appreciated the praise. Gravelly voiced Matsson opened with “Like The Wheel.” The intensity in his voice came from the fluctuating power and simultaneous harrowing whisper. A voice that sounds like an overdrive pedal. A voice that sighs like a newborn. The guitar change between every song hailed a lot of beautiful equipment. He was passed a red Telecaster, a red Gibson ES 335, and a multitude of small acoustic guitars that only he seemed to know the tuning. With a Capo typically placed on the twelfth fret, his songs are reminiscent of Bob Dylan, Woody Guthrie, and John Prine. Protesting only emotions of faded relationships.